A biography set in the glitzy world of private high stakes poker games, Molly's Game is a remarkable story of a woman navigating her way through money-drenched terrain where celebrities and less savory characters intermingle. Two years after hosting her last poker game and soon after publishing a book about her unlikely experiences, Molly Brown (Jessica Chastain) is arrested by the FBI for operating illegal gambling tables. She seeks the services of lawyer Charlie Jaffey (Idris Elba), and as she tangles with the legal system her story unfolds in flashback. Born in Colorado and driven hard by her psychologist father Larry (Kevin Costner), Molly was striving for the US Olympic skiing team when a severe crash ended her hopes. She moved to Los Angeles and through her new employer Dean (Jeremy Strong), a real estate developer, she gets involved in hosting poker games for Hollywood's elites, including a famous actor referred to only as Player X (Michael Cera). Molly learns all she can and gradually establishes a name for herself, keeping the games clean and legal. Eventually she breaks away from Dean and creates her own brand. But a squabble with Player X ends badly, forcing Molly to relocate to New York and start over, this time with higher stakes both at the table and in her private life. 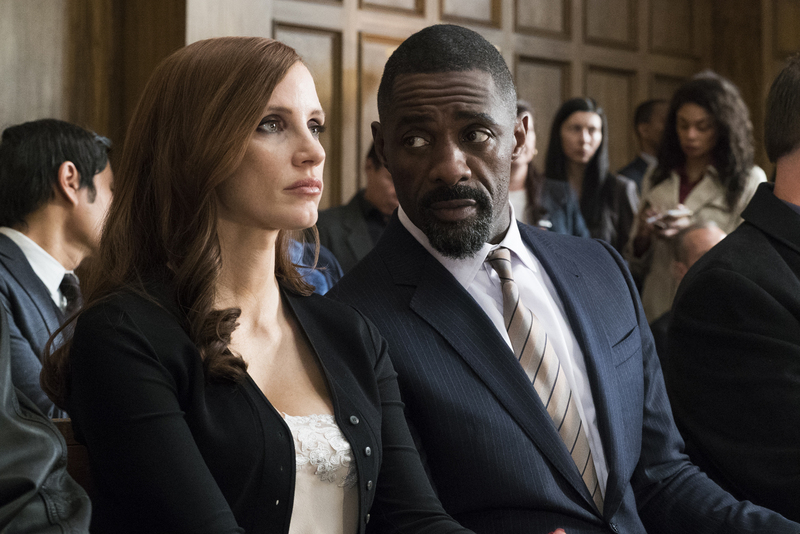 Written and directed by Aaron Sorkin, Molly's Game is a fast-paced trip fuelled on ambition. The film is immersed in the decadent and ultimately barely consequential milieu of wealthy people trading fortunes at the poker table. But Sorkin latches onto the theme of a desire to achieve ignited by broken dreams, and weaves an intriguing narrative around a woman carving her place in a secretive male-dominated world. Despite the preponderance of players, lawyers, agents and mobsters, Molly Bloom is the one well-rounded character worth caring about in the film. Sorkin draws out plenty of background from her childhood, particularly a difficult relationship with her father who is also a coach, booster and expert on mind games. And within her family Molly struggled to meet expectations, developing a sense of bratty insecurity among high achieving siblings. Molly's accident on the ski hill frames the film, and becomes the catalyst for a woman determined to climb to the top step of whatever podium is available. At 140 minutes, the film is a good 30 minutes longer than it needed to be for a relatively small story. In his big screen directorial debut Sorkin allows plenty of flab to creep in. Scenes routinely go on longer than they need to, some details about individual poker hands intrude on the narrative, and the editing is lazy. But the dialogue is often crisp, and Molly finds a worthwhile sparring partner in lawyer Charlie Jaffey. His role grows as the film progresses, the lawyer finally figuring out what makes his client tick and placing it into context. Jessica Chastain dominates the film and brings Molly to life with plenty of energy and occasional hints of vulnerability and loneliness. Idris Elba and Kevin Costner provide steady support. The men around the table, including Player X (allegedly modeled on Tobey Maguire) remain relatively featureless examples of card players succumbing to base masculine competitive instincts and wasting away money, talent, time or all three. And where men with too much money and power are addicted to foolish pursuits, a smart woman can find her place to shine.